Premise: Inspired generally by Dorothy Uhnak’s 1970 novel, The Ledger, but certainly influenced by “blaxploitation” films of its era, this show starred former Laugh-In regular Graves as the first African-American female undercover cop on the Los Angeles police force, working to bring down drug dealers and other high-risk malcontents. The big-’fro’d, bare-midriffed Ms. Love had a smile to melt hearts, but she could also protect herself in dangerous situations, whether with a few karate chops or several well-aimed swings of her capacious handbags. And she rarely failed to deliver her signature line when apprehending criminals: “You’re under arrest, Sugah.” Her initial LAPD supervisor was the perpetually concerned Lieutenant Matthew Reardon (Cioffi), replaced in later episodes by former Maverick co-star Jack Kelly as Captain Arthur Ryan. 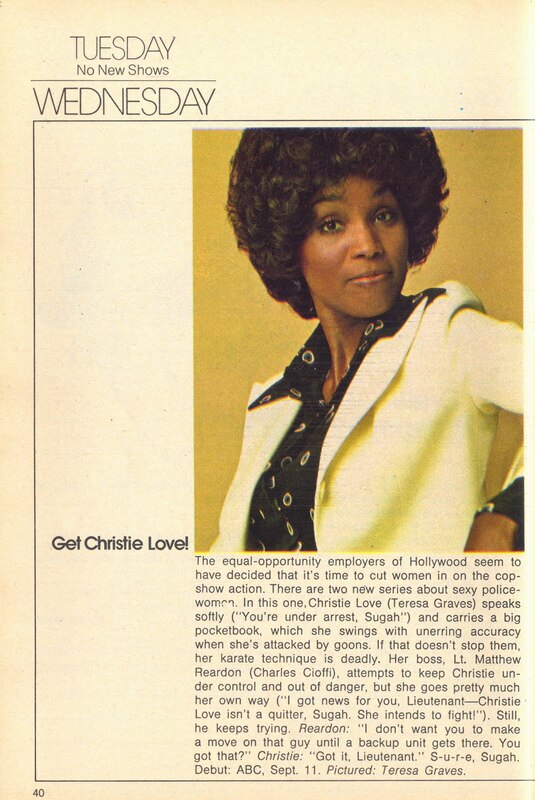 Above: Get Christie Love!’s write-up in the September 7-13, 1974, Fall Preview edition of TV Guide. (Click to enlarge the image.) Below: A 1974 promotional spot for Graves’ series, plus its original main title sequence (with a theme sung by Luchi De Jesus). This third video clip is the final version of the series’ opening title sequence, made after Jack Kelly joined the cast. The new theme music was composed by Glen A. Larson and Stu Phillips. READ MORE: “She’s a Cop, Oh Yeah!”: Get Christie Love!, by Hal Horn (The Horn Section). Donna Mills did the movie, but I liked Graves as Christie Love. Then she got religion . . . I think you might be mixing up your movies here. Donna Mills appeared in the 1973 teleflick (and unsold TV pilot) made from another of Dorothy Uhnak's books, The Bait. But Teresa Graves was in the 1974 pilot film for Get Christie Love!, and went on to star in that series. Cioffi played a similar role in the first SHAFT film. He's also great in the TV movie MONGO'S BACK IN TOWN, with Joe Don Baker, based on the E. Richard Johnson novel. Jeff, both films were based on her character Christie Opara, weren't they? Wallace, I really enjoyed the Mongo movie, and many of Johnson's books. You're right, Bob: Both Donna Mills' The Bait and Teresa Graves' Get Christie Love! were based on Dorothy Uhnak novels starring white Hungarian-American policewoman Christie Opara. Although Mills' protagonist became "Tracy Fleming" in the teleflick, the plot still stuck closer (as I recall) to Uhnak's original story than Graves' pilot film, Get Christie Love!, did to the source material provided in The Ledger.